It's easy to tell time the smarter way with Fossil Smartwatches. This watch features a rose gold tone case, and crystal embedded bracelet strap. With a customisable dial and touchscreen functionality, this timepiece tracks everything from daily steps to calories. Notifications alert you of incoming calls, texts and much more, and a built-in microphone and speaker allow you to do a variety of tasks on your smartwatch using just your voice. Stay charged for up to 24 hours (based on usage) with the magnetic wireless charger. Powered by Android Wear, this touchscreen smartwatch tracks activity, connects to your favourite apps, receives display notifications, and has customisable faces to fit your style. Fossil Smartwatches is compatible with phones running Android™ OS 4.3+ or iPhone 5/iOS 9+. Supported features may vary by platform. 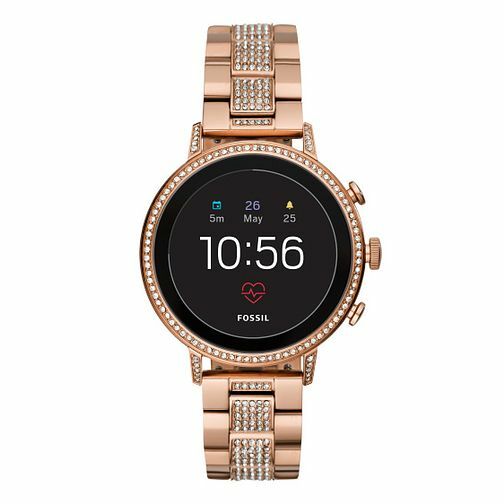 Fossil Smartwatches bring a minimalist style to cutting-edge technology.